Osteoporosis is defined as a skeletal disorder characterised by compromised bone strength predisposing to an increased risk of fracture. Osteoporosis is a very common finding in patients with chronic kidney disease (CKD). This is best illustrated by the fracture risk increasing parallel to decline of renal function. In patients with end stage renal disease the hip fracture risk is 4-fold higher than in non-renal counterparts. The impact of a major osteoporotic fracture, already high in non-renal patients is impressive in dialysis patients, with 1-yr mortality rates exceeding 60% in patients who sustained a hip fracture. The pathophysiology of osteoporosis is complex with CKD-related risk factors adding another level of complexity. Osteoporosis in CKD often may be considered the composite of primary osteoporosis, drug-related osteoporosis and renal osteodystrophy (ROD). Osteoporosis should not be considered in isolation, not at the least in CKD. Indeed, growing evidence points to the close interaction between bone, muscle and vascular (patho)biology. Acknowledging these interactions is not only importantly from a pathophysiological, but also from a therapeutic perspective. The armamentarium to tackle osteoporosis is expanding, with anti-resorptive agents remaining the cornerstone of the treatment, at least in postmenopausal women. The benefit-to-cost ratio of anti-resorptive agents in the treatment CKD-related osteoporosis is a matter of much concern. Both efficacy and safety of these agents in CKD are poorly defined. In the absence of good evidence, a pragmatic approach is required. EUROD is about to circulate a survey among CKD-MBD ordinary Working Groups members to learn more about current attitudes with regard to the screening and treatment of osteoporosis in CKD. The results of this survey will be discussed during the meeting. We also will present an algorithm for screening, treatment and monitoring of CKD patients, that resulted from a consensus meeting involving bone experts with a diverse medical background. 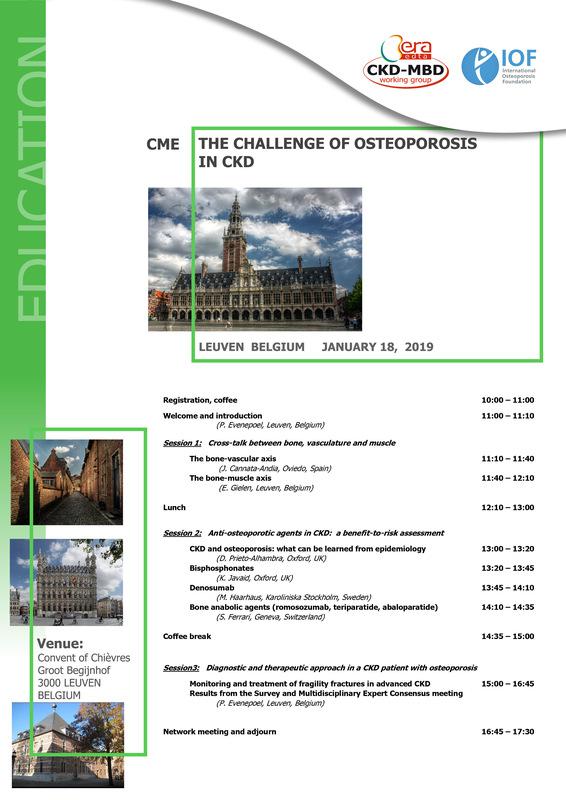 The present CME, organised by the ERA-EDTA and endorsed by the International Osteoporosis Foundation (IOF) aims at providing an update on the clinical assessment and treatment of osteoporosis in CKD anno 2019, both by means of state of the art lectures by key opinion leaders and interactive (with voting system) discussions. The CME will end with a “network meeting” allowing the informal discussion of both clinical and research topics in ROD with peers and experts. The meeting will be held at the Faculty Club, Tervuursevest 70, 3000 Leuven (Belgium). Click here to pre-register. Registration is free of charge. 4 European CME credits (ECMEC®s) by the European Accreditation Council for Continuing Medical Education (EACCME®). Are you a young ERA-EDTA member? Apply for travel grant?